The retail ecosystem is currently going through a spectacular era of transition. Large number of business are drifting towards online stores, retailers too are looking for similar impressive unconventional methods to increase their sales and to keep the customers engaged while offering an enhanced user experience. One of these unconventional methods is the Retail kiosk. Retail kiosks are interactive in nature and last few years have shown a noticeable growth in the number of kiosks installed in the retail sector as business houses are adapting different ways to escalate sales by enhancing the customer’s user experience. Equipping consumers with helpful and pertinent information that he/she is looking for through retail kiosks at the moment of choice creates a positive buying environment for the customer while simultaneously creating a valuable shopping experience. All thanks to the Internet and Google, consumer has become so addicted to access information on demand as and when required. This addiction has become part of their daily lives and hence they look for such options while they go for shopping at retail stores as well. No consumer today wants to wait for his/her turn to get noticed by the salesman and listen to his outdated and less informed sales pitch. Information on the finger tips trend is all set to accelerate hence making it almost mandatory for large and small retailers to take advantage of new emerging technologies with huge range and variety. Retail Kisoks can be used in various ways: from multi-touch user interfaces to solutions for assembling user information. – The level of functionality that a retailers requires as per their business preferences and needs like if they require the kiosk designed to provide information only or to they want an upgraded version where they can take the customer through information giving section to information collection section to the transaction section finally. – The ‘quality’ of the user experience that a retailer intends to offer their customers. For example ease of use and the satisfaction level. – The ability of the kiosks to operate in harsh environment and peak footfall time. – The ability of the kiosk to increase and expand scope of operation as and when required. Doesn’t it seem that more and more machines are coming up in the most not likely places? You will find the Self-order express kiosks in retail shops. In government places you will find touch screen computers offering information to the public. Even the supermarkets are also using the kiosks. In almost all the sector you will find kiosks. Kiosks have gained the lot of popularity in the retail sector. Before purchasing anything, customers want to have the detailed information about the products and services. These retail kiosks help the customer to come close to the company by providing them the information about all products and services. Even the sales person hired in the retail outlets lack the communication skills due to which they are unable to sell the products and services. 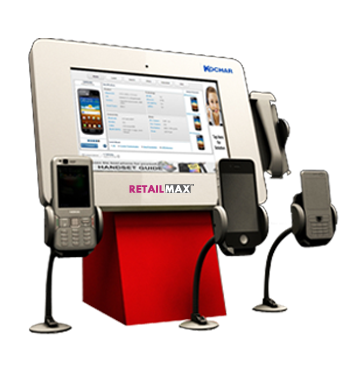 Retail Kiosk is the best solution to be used by the enterprises. It will not only give the user information about the product and services but also helps to build the brand image of company. Sometimes it becomes very challenging for the company to display all the products and services and showcase them to the customers and the customers also want to see the wide variety of products together. Kiosks are the best option to show it to the users. These kiosks will exhibit all the products and services they have in their outlets. Sometimes clash arises due to the lack of communication between what customers want to know and what salespersons are telling the customers. This Retail kiosk will help the customer to understand the each and every facet of products and services. Through this they can know the features and benefits of the customer. Touch screen kiosk is the ultimate sign of digital signage technology. Without the need of mouse or keyboard, this digital device helps to deliver two-way flow of information between a business and its customers, or an organization and its clients. 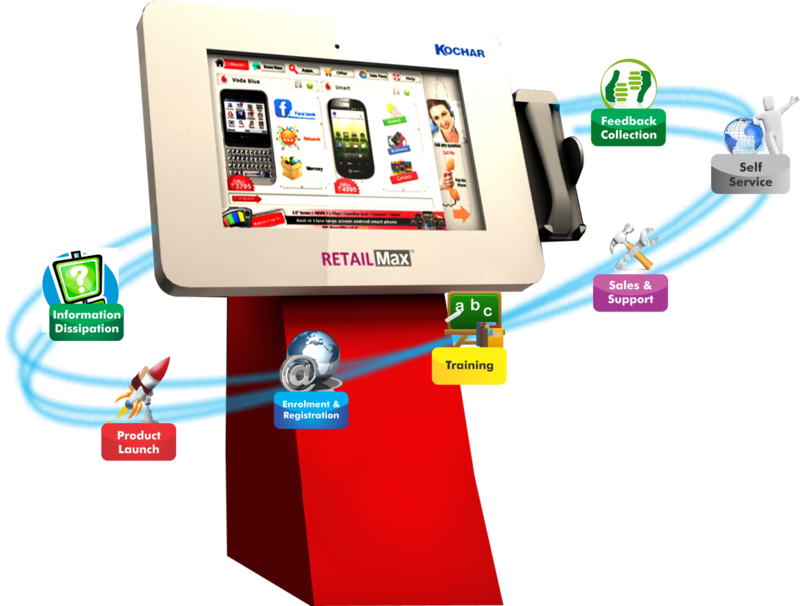 Retail kiosk is the user friendly interface that helps the enterprise to reach the larger audience. It helps the customers in purchasing the products easily. Customers can compare different products information and their prices with the help of the kiosk. Retail Kiosk can offer the service to the customers 24×7. Majority of the organizations are following the trend of retail solutions as it helps them to increase the sales and widen profit margins. It is beneficial for the entrepreneurs to reach the wider audience. It helps to build loyalty among the customers. Retail kiosks help companies to display their customers’ large variety of options. With help of kiosk customers can save large amount of time. Customers can get all product related information along with price comparison in just one touch. It helps the company to increase the sales. Enterprise can expand their range of offering to their potential customers without increasing a single square foot of commercial retail space. It helps the company to decrease the cost as they do not need to spend extra money on the labor cost. It helps the company to promote the product. KocharTech offers RetailMax solution that intermingles entirely with customers to give them customized end to end solutions. It is a firm and tested base solution to communicate with customers for main reasons like feedback, product dissipation, sales and support etc. Is MDM Solutions a need, Why corporate is still shying away?